This extensive trauma first aid training kit is an important component of solid emergency preparedness for any facility. This kit is designed using the experience of leading disaster response organizations to meet the emergency medical needs of up to 50 people at a school, workplace, or other facilities. 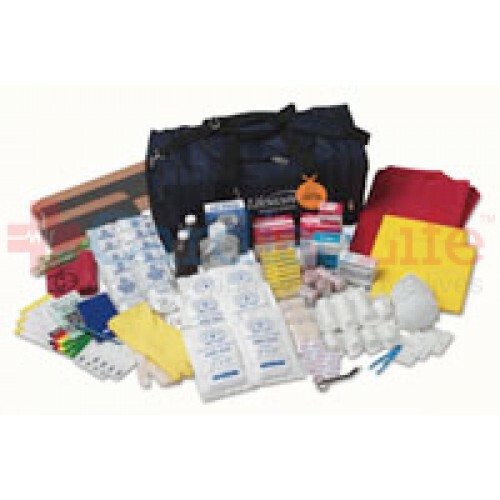 The instructions and supplies in this kit can be used to provide first aid until qualified professional medical help arrives and to assist the professionals once they are on the scene. Many organizations offer expert first aid training for volunteers. 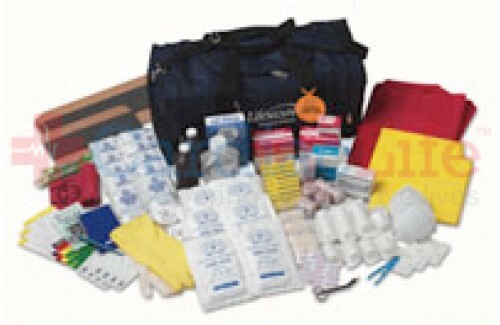 The kit includes emergency first aid instructions and supplies for the medical support of search and rescue operations; treating victims for shock; treating fractures and dislocations; cleaning, dressing, and bandaging wounds; the application of cold for healing; and storing instructions and emergency plan documents (waterproof pouch). The large trauma duffel bag makes supplies easy to store, carry and access for use. For additional help with search and rescue operations, purchase one Search and Rescue Team Kit for each volunteer search and rescue team in your facility. Packed in a large trauma duffel bag with double hand straps, adjustable shoulder strap, wide-mouth main compartment for easy access to supplies, and multiple pockets for easy organization. The bright orange tag identifies kit in an emergency.